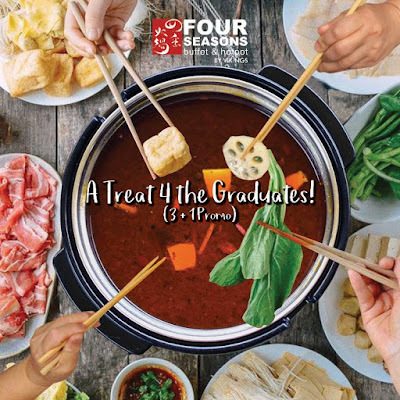 Graduating students of class 2017 get to eat for FREE at Four Seasons Buffet & Hotpot. Each 2017 graduate should be accompanied by THREE (3) full paying adults. The graduate should present ANY of the following: Diploma, Graduation Photo, or Graduation Program with the graduate’s name/ceremony invitation (all supported by the school ID). Only those Moving Up and Graduates of Class 2017 can enjoy this promo (Graduates of Kindergarten, Elementary, and College: Bachelor, Master or Doctor’s Degree). This promo is available on weekends and weekdays including holidays for both lunch and dinner. Special Gift Certificates cannot be used in conjunction with this promo. This promo runs from March 15, 2017 to June 30, 2017. This promo is available in all Four Seasons Buffet & Hotpot branches - SM MOA By the Bay, SM Southmall, and Manhattan Parkview Cubao. Please call (632) 845-4647 for inquiries.